The following are instruction manuals for the Nintendo DS game Sonic Rush. 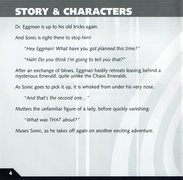 Dr. Eggman is up to his old tricks again. And Sonic is right there to stop him! "Hey Eggman! What have you got planned this time?" "Hah! Do you think I'm going to tell you that?" After an exchange of blows, Eggman hastily retreats leaving behind a mysterious Emerald, quite unlike the Chaos Emeralds. As Sonic goes to pick it up, it is whisked from under his very nose. "And that's the second one..."
Mutters the unfamiliar figure of a lady, before quickly vanishing. Muses Sonic, as he takes off again on another exciting adventure. This page was last edited on 10 February 2019, at 18:39.